You might not realize it, but fonts play a very important role in how a design (of any kind) is communicated and interpreted. 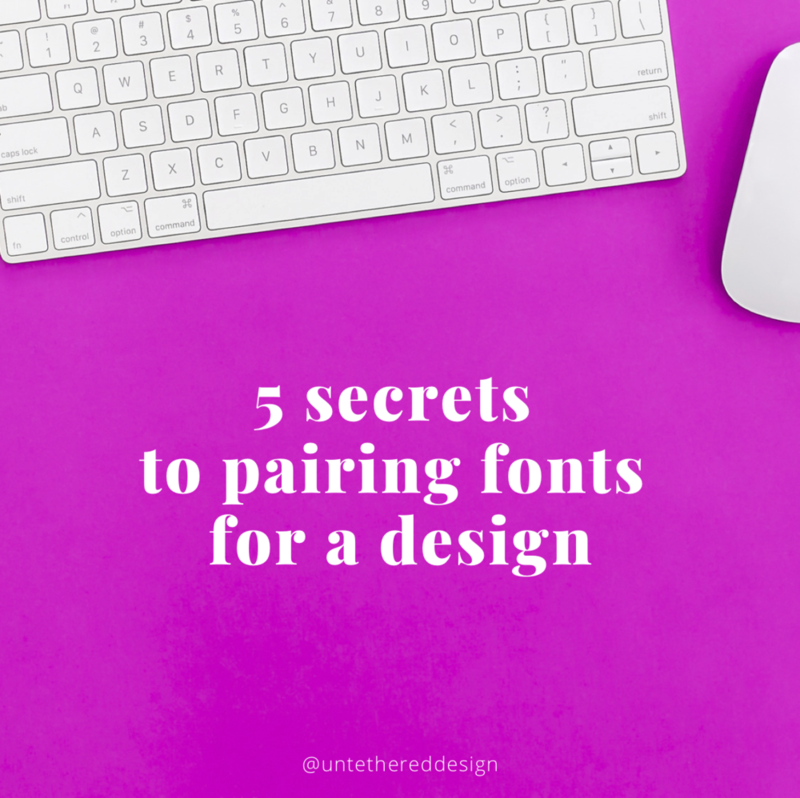 Just like colors, photography and any other graphic elements, the fonts that are carefully chosen to be paired together can make or break a design — and allow it to stimulate certain feelings or express an overall style or personality. A bold and harsh font that is “in your face” might be perceived a bit differently from one that is lighter, simpler and cleaner. In the same vein, a font that is more youthful will communicate a message in a more playful or energetic way — making you automatically assume that it’s connected to a school or child’s activity. Handwritten fonts can give a design a more “personal” touch, while an elegant script or calligraphy-style font is the perfect choice for formal invitations and events. Fonts, just like any other elements of design, evoke different emotions because of their integration into the overall typography of a design (think of typography as the way type is arranged and structured to look.) Their individual point sizes, styles and weights can be applied to words for emphasis or to draw attention, placed into longer blocks of copy for easier reading, or often pulled out into sidebars to display statistics or quotes attributed to someone. 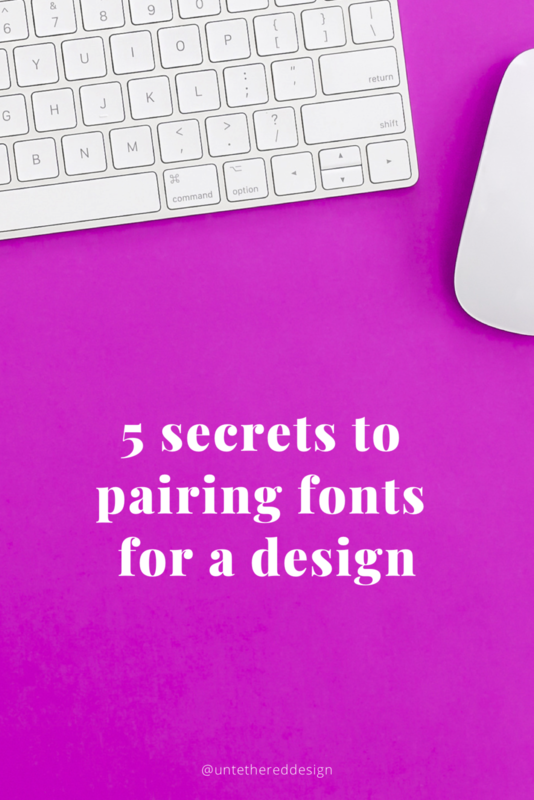 Because fonts play such an integral part of a design (whether it’s for an entire website, sales page, brochure, business card or social graphic) it’s important to know how to choose them, how to pair them and where you can find them. A serif typeface has little lines (or strokes) added as embellishments at the ends of characters. Times New Roman is a generic example. These are good to use when reading large blocks of text (like you often see in books) and are great for professional and traditional purposes. Popular and more sophisticated serif styles used in design today might include Garamond, Baskerville or Sentinel. You want something that can be used for headings or subheadings and is easy to read, especially in large blocks of copy. You will also want something that can be used to help break up the copy and will give someone’s eyes something else to rest on and look at. A big tip is to choose fonts that come from “families” — basically meaning that there are different variations of each (like regular, bold, italic, etc. mentioned above) — this way, they will be more versatile to work with. A sans serif typeface doesn’t have the serif strokes coming off its characters. (Hence the “sans.”) Arial and Helvetica are common examples. This style of font has a cleaner, more modern look and feel. The same tips for choosing a serif also apply to choosing a sans serif. They are simply two different styles of fonts that can be used together, to balance each other out. When we talk about pairing fonts, we are usually referring to teaming up a serif with a sans serif. For example, I often use Museo or Playfair Display as the serif options within my studio branding, while Museo Sans or Open Sans are my sans serif go-tos. It’s just a good rule of thumb to have both that you use consistently within visual branding or even an individual design. A script typeface is, as you might guess, “script-y.” It’s meant to look like cursive handwriting, or on a fancier level, even calligraphy. It’s meant to not be overused, but is great for accenting pullout or highlighted words in a headline or quote. I like to use one to complement my pair of serif and sans serif fonts in a brand to give designs a personal, classy and sophisticated touch. I also use it sparingly within social graphics or printed on my physical shop products, again, to give my visual branding an extra “splash” and dimension. Now, choosing the right serif, sans serif and script options to complete your design’s font collection is majorly dependent on what your brand or design is representing, communicating or promoting. Who are you, what do you do, what are you about and whom do you serve? How do you want to make those people feel? Think about the experience that you want them to have when they come into contact with any aspect of your brand or this particular design. The typefaces that you use within your logo, website, marketing materials and social media graphics need to tell stories and represent your brand accurately. So, consider if you want that style (and in turn, the fonts) to be light, modern, sophisticated and soft — or big, heavy and bold. Or, something entirely different! Fonts and the right combinations of them can provide you with major impact — and look and feel. Again, they evoke emotions and express specific personalities. Google, I couldn’t agree more. When you choose fonts that can be used seamlessly across print and digital mediums and you can use them consistently, it allows your brand (or any design) to simply look more professional. Google Fonts is a great resource for only only web-safe fonts, but professional fonts in general. Now, where can you find the other serif, sans serif and script fonts mentioned above? Check out this post — where I offer resources for downloading free/trial fonts, as well as purchasing premium versions and licenses. 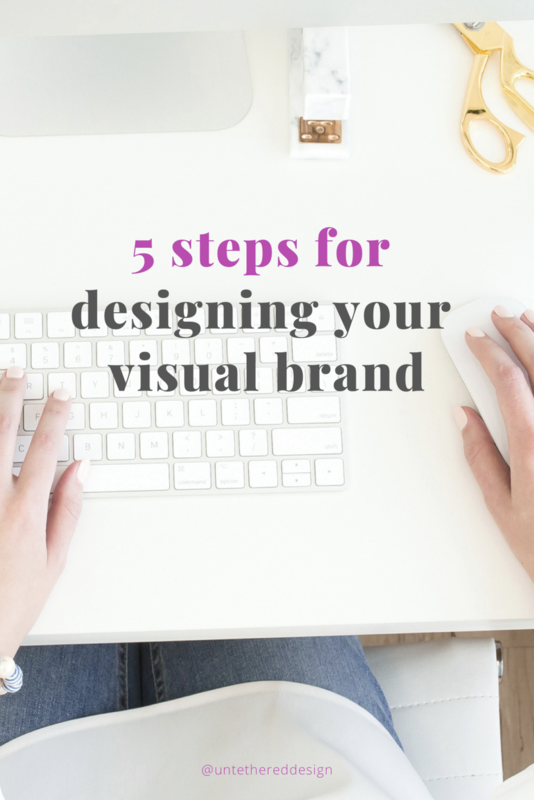 Have you ever wondered how a visual brand identity comes together, from concept to completion? From finding inspiration for the brand itself, to the first sketches and drafts of logos, to piecing together just the right combinations of colors and fonts, to creating the secondary logos, icons and assets that get used on a website, social media graphics, slide decks, printed materials and more? 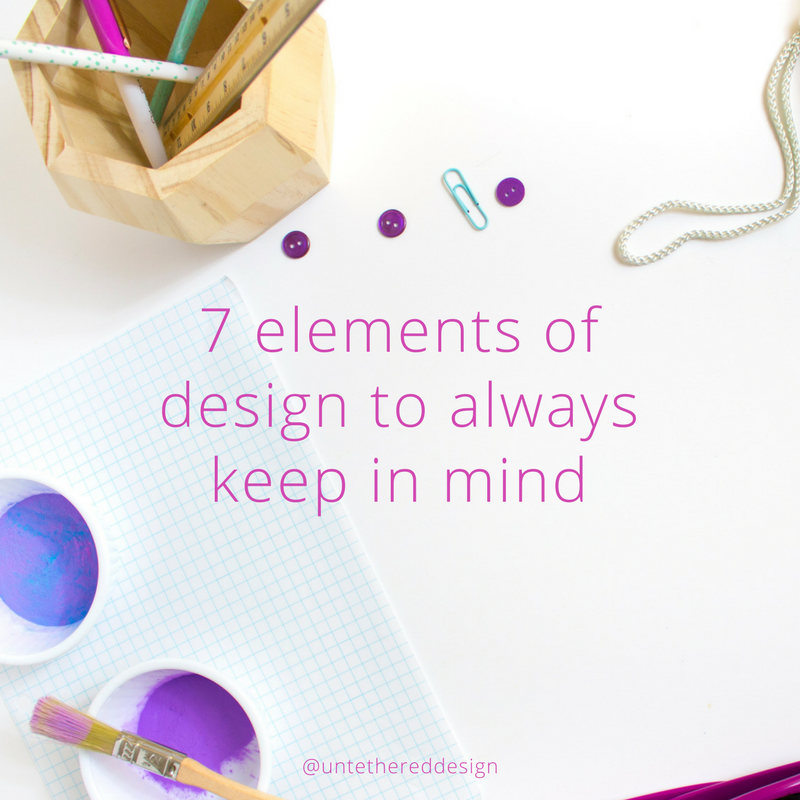 It can be a challenge to know when and how to start the design process in an orderly way that allows certain ideas and concepts to naturally develop, evolve and flow from one step of the process to the next. 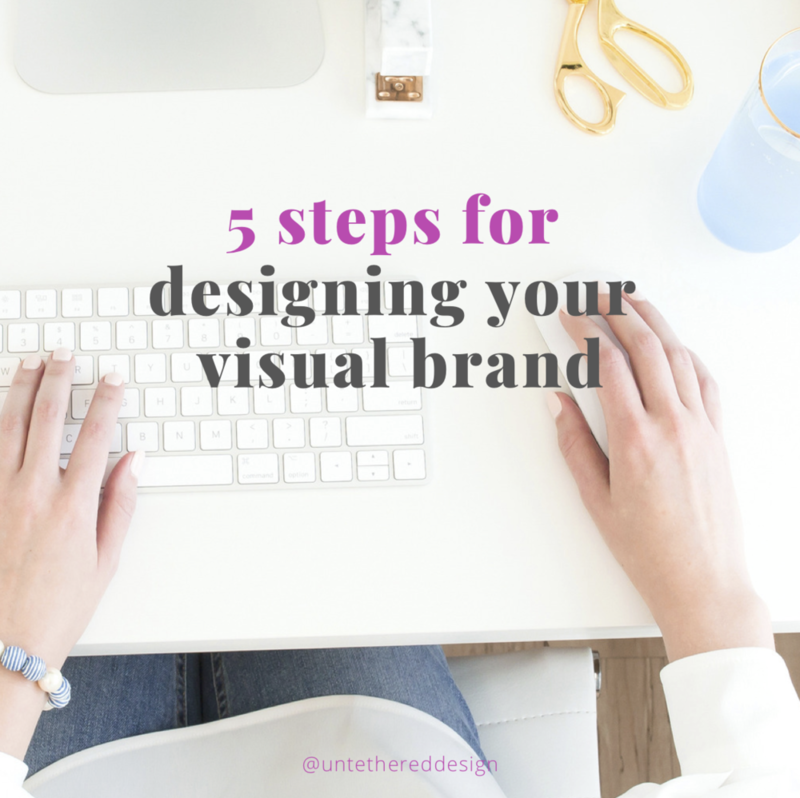 A lot of time, revising, refining and hard work goes into a visual brand that will look professional, be relevant and stick around for a while, but the framework can still be simply broken down in ways that are easy to implement and execute. I have refined my design process over the years and nowadays, there is a simple, 5-step framework that I follow each and every time someone signs on to work with me. This way, my workflow is consistent and systemized — and I can give someone the same quality process over and over. Follow these for yourself and discover the amazing results. 1) Create a Mood Board: I go through a "brand personality assessment" with the client to nail down the style, vibes and emotion behind the brand — that then translates into a mood board that sets the tone for the brand "at a glance." The mood board is a collage of imagery (that consists of photos, colors, textures, patterns, icons, quotes, etc.) and it's digitally-generated. Only meant to serve as inspiration for the overall visual identity that will soon be built. 2) Design Logo Concepts: While many designers take the "1 concept" approach and maybe I'll be brave enough to try that one day, I personally like to give my clients a variety to choose from. Sometimes this is 4, even up to 6 — if I'm feeling really inspired and creative. We go through revisions + tweaks until we have a final design that is "the one." If we already have a set color palette to work with, then I design using those colors and format the final logo files in the proper sizes, formats, resolutions + color systems. If we need to explore palettes a bit more, then I will design the concepts in black and white for the moment. This way, the focus is really on the design and clients aren't as distracted by the initial color drafts. 3) Choose Colors + Find Fonts: Next, we move onto exploring different color palettes and font pairings. If particular fonts used in the logo happen to work for the regular brand fonts (to be used across the board of various materials and graphics) then we roll with those. As long as there are serif + sans serif options. If we used a more decorative, handwritten or unique typeface in the logo, then I offer a mix of font pairings that I think will complement the brand and the client can choose which ones they like the best. Usually, a client will have a general idea of the colors that they like, so I will keep those in mind and generate 3-5 palettes that reflect those. Sometimes, if necessary, I will throw in a "wildcard" — just to give them something different to consider that they otherwise wouldn't have and to compare others back to. 4) Build the Brand Assets: Here is the fun part! Now that we have a beautiful logo, colors and fonts all solidified, we get to build out the rest of the brand identity! This includes whatever assets are needed. I will create anything from textures and patterns, to a secondary logo to an icon library — it just depends on what the client plans to use for their collateral, website, etc. I then piece it all together and design a brand board. This is a single display of all of the assets organized and how they can work together, to give a quick preview of the entire identity. It's helpful to share with other client partners, vendors, printers, etc. so that the brand visuals stay intact and are used cohesively and consistently across various platforms. 5) Apply the New Brand in Real Life: Now that we have the entire visual brand created, it's time to "apply it in real life." Through the creation of social media graphics, business cards, PDFs, a website and more — it's important that the same elements are used over and over — to again, ensure consistent and professional applications of the brand. Whether someone experiences you online or offline, through your blog, a podcast, a sales page, etc. — they should always see the same identity. I always refer to Starbucks as having an obvious strong brand awareness — whether you walk into a shop, use a gift card, visit their website or follow them on Instagram, you will always have the same visual experience. The same should be true of any professional brand! Crafting a mood board can be a crucial aspect of any pre-design process because it’s a quick and effective way to set the graphic and emotional tones of a project. In case you’re not sure, a mood board (or vision board or inspiration board) is simply a collage of imagery that conveys the overall look, feel, personality and identity for a particular collaboration or event — very handy when you’re having a hard time presenting or expressing your vision and ideas. Most people use a mix of photos, colors, words/quotes, typefaces, textures, patterns, illustrations and more to showcase a variety of visuals that will inspire and give life to a larger design concept. It doesn’t matter whether you are focused on your branding, a website, a brochure or ad campaign. A mood board can be created for literally anything! It can even be used when you’re planning to renovate a room in your house and you want to curate the colors, style and vibes before you buy that first can of paint, carpet, trim or fixtures. 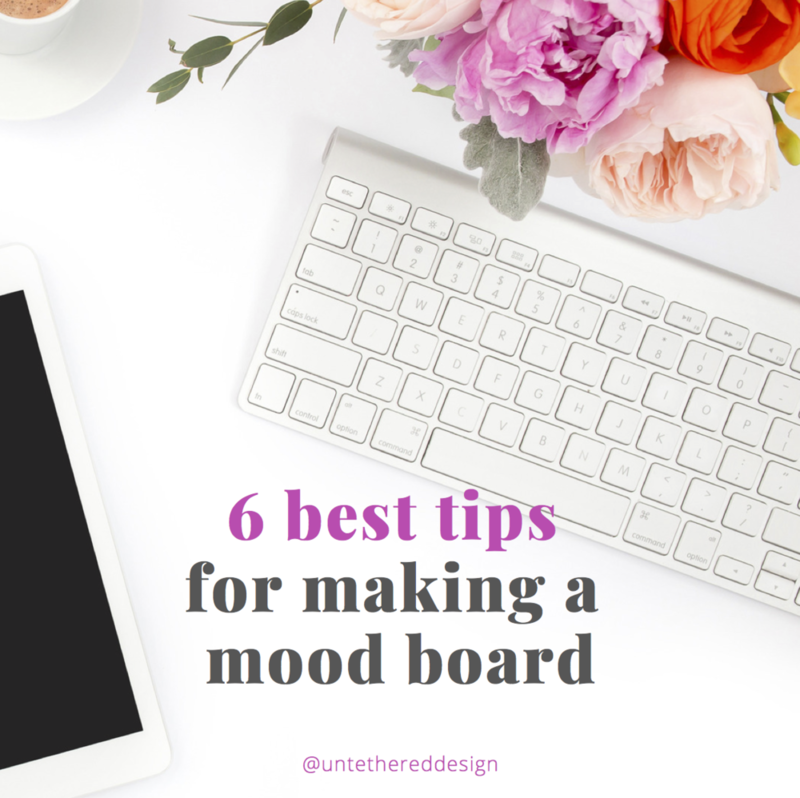 Without further ado, let’s dive into 6 best tips for making a mood board for your next big project! Canva Mood Board — Canva offers countless templates that you can play with. 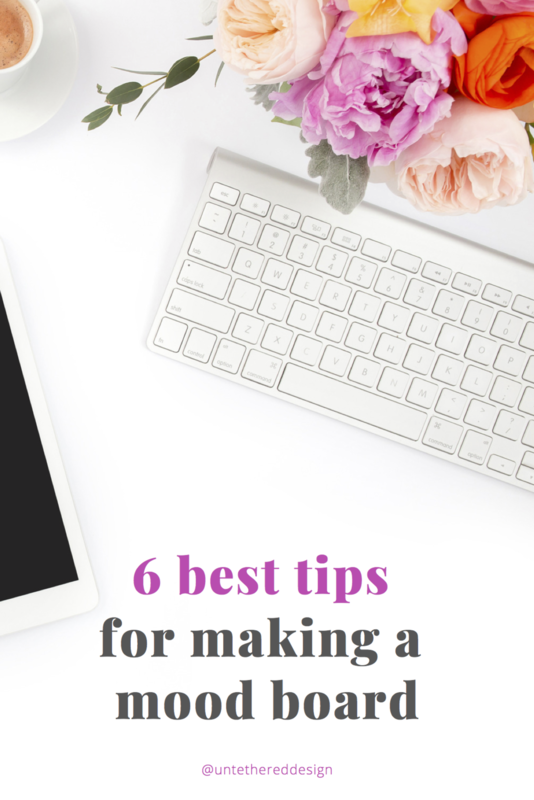 If you’re not already using Canva, you can sign up for a free account. It’s easy and user-friendly! Milanote — This is another website through which you can grab a free account. You can use their pre-made templates or design your own, as well as use their pre-loaded imagery or upload your own. They take it one step further and even allow you to upload videos and animated GIFs, so that your boards can be really modern and dynamic! Plan with Pinterest — If you’re designing a digital mood board, you can create boards and save pins that resonate with you, save them to a folder on your desktop — and then add them to your mood board(s) later. (Or, print them off for your physical board!) Pinterest makes it easy to find specific types of images, so that you’re not spending a lot of time searching Google (even though, you can totally use Google, too.) Again, try to collect a mix of photos, colors, quotes and textures that will really capture and express the essence of your design’s identity. Think emotional, not just literal — Something important to keep in mind is not just using images that physically represent your brand (or any other design initiative.) Think “mood” after all! What feelings do you want to express? Colorful, youthful, vibrant, bold? Light, whimsical, fresh, airy? Sleek, sophisticated, elegant, chic? Whatever the direction, especially be sure to include colors that speak to these emotions — that will make someone truly feel something. Consider your audience — Don’t just create a mood board with no clear direction or messaging in mind. Think about the project that you’re using the mood board to inspire and think about the audience who will be experiencing it. Don’t just put a collage together of random photos, text and colors that don’t make any sense. Have some rhyme and reason to the overall “puzzle” that you’re piecing together. This idea goes back to thinking about the emotional aspects of the board — be clear on who you’re speaking to and what about. Create at least 3 — There really are no rules, but I like to create at least 3 different mood boards initially (all using the same overall look and feel) and then take the best combination of imagery from each and make (1) really strong one. Tweak your board until it’s a good representation and expression of your design vision. Only use it for inspiration — Remember that if you’re pulling images from Pinterest, Google and even from publications — they have copyrights. Putting together a mood board should be strictly kept for the “conceptual” phase of your design project — and not for anything that is publicly distributed, shared or published. For example, I would be careful about not sharing it on your blog or website. I normally only share a mood board 1:1 privately, with a client. I’m not a lawyer and suggest consulting one if you have questions! Just be aware of the legal and illegal uses of imagery that belong to other people. It doesn’t matter whether you’re designing (or working with a designer on) a sales page, brochure, logo, Facebook graphic, poster or even a billboard — the original and basic elements of graphic design apply (and should always apply) to any and all types of design — print, digital and even traditional fine art. 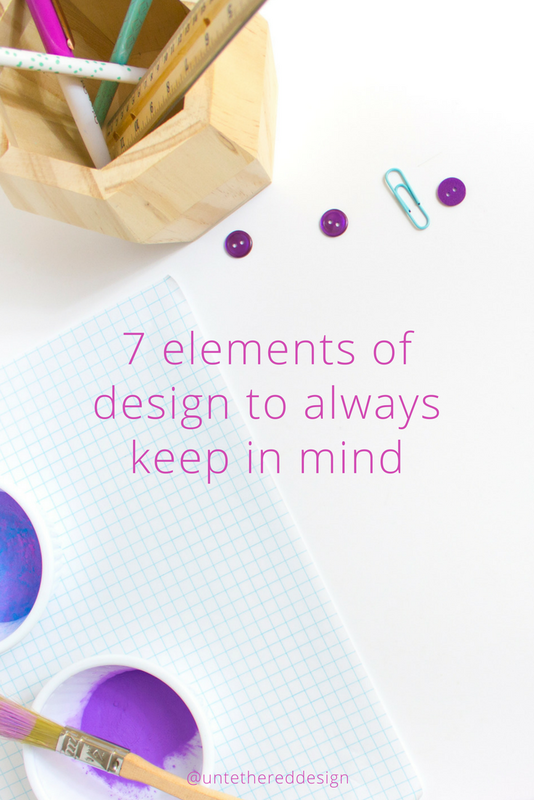 The seven elements are the foundation of good design and span centuries back. These same elements can even be applied to other art forms like photography, painting and sculpture. No matter how modern and digital that design gets or how much that technology changes, these simple elements will always be the core of design. They need to be considered throughout all phases of a project, in order for a design to be thoroughly executed with the highest quality. If you aren’t already familiar with these, think about each one the next time that you open a design file and ask yourself if each one can be applied to and is present in your design. Shape: A shape is a defined area or dimension that stands out from what is around it. For example, think about a poster that has a big, bright circle placed off to the side, with text placed over the top of it that reads “Special Discount!” The circle is meant to serve as a little, extra “pop” on the page that stands on its own, to display a unique and separate message from the rest of the text in the design. In fact, all objects are actually made up of other shapes. Shapes can be specifically geometric (like a square, circle or triangle) or abstract (like a starburst or organic shape that is made up of uneven lines and multiple sides.) You can use shapes to help different pieces of your design stand out — just like the circle on the poster referenced above. Space: Similar to shape, space is also a defined area around the other elements in a design. You can use it to separate or bring together pieces of information and other details. You can use it to control what your audience sees or reads first and to illustrate bigger or more important information, or smaller details that can be consumed later. Value: Value is simply how light or how dark an area of design looks. It can be very dark or really light. The value that you place, similar to space, will help your audience to read and see important aspects of a design right away. Value can help to create contrast, brightness and saturation. Obviously, you will notice something that is darker and bolder in a design a bit more quickly than you will something that is lighter and smaller. Size: Quite simply, the size that you apply to an area in your design will determine how important it is. If you create a headline to read in large, bold print across the top of the page or you place a photo that is dominant and it takes up a large portion of the design, those larger size pieces of your design are going to be seen first and as the most prominent. Texture: When it comes to the surface of a design, you can add extra graphic contrast by applying a texture or pattern to the design or even to an area of solid color. It adds some visual interest and can make a design feel like it’s 3-dimensional or even coming off of the page. It adds a layer to design that none of the other elements can do — to the point of making someone almost feel it if they were to touch it. Color: Color might just be my most favorite element of design. I love the simplicity and contrast of a black and white design or photo, too, but you just can’t beat a color palette that is visually-pleasing and engaging to a viewer. Color can generate emotion, designate an area of the design and either separate or bring together other elements on the page. For help deciding what colors to use in your branding or in any simple design, refer to this blog post. If you’re not a design professional, branding might be something that you don’t love to do for your business or you simply don’t have time for, so let someone else take over! Sign-up below to receive the link to download my new and free PDF tool “Branding 101: What it is, what it isn’t and why you need it” — right now! This quick and simple guide will walk you through why it’s important to establish consistent and memorable branding within your biz — and if you can DIY some of it or if you should hire that professional. If you have any questions after going through it, let’s connect and chat some more!